Earlier this year we received a fabulous set of books and bookshelves donated on behalf of The Duchess of Cornwall, through the Beanstalk charity. We have a great team of volunteers from Beanstalk who read twice a week with children in school and provide really valuable support, the Duchess of Cornwall is a patron of their charity. 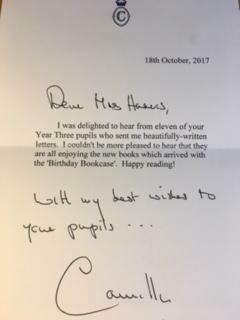 Our Year 3 children wrote to the Duchess to say a big thank you and this week we received this response.